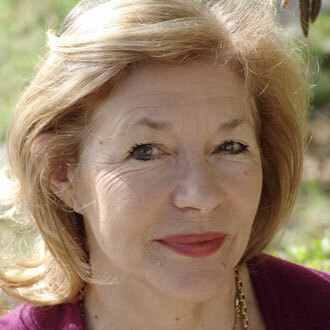 Interviewing Carol Drinkwater has been on my mind ever since I read her first book about becoming an olive grove owner, The Olive Farm, in 2001. Since then, she has written six more books in this series and is about to publish yet another. While the series is not, per se, exclusively about olives and olive oil, it is about how olives and olive oil can have a profound effect on one’s life. Certainly, the series serves as great publicity for the industry. Award-winning actress and acclaimed writer, she brims with enthusiasm when the subject of olives comes up. For the uninitiated considering jumping into the business, her books can support all those romantic notions that get us into trouble in the first place. Next on her agenda is expanding awareness of “olive life” with a UNESCO-supported film documentary series currently in development. She took time from her very busy schedule to share some thoughts about the allure of the little olive. Why did you first get involved in the olive oil industry? With Michel, the Frenchman I had recently fallen in love with, we found an abandoned olive farm in the south of France. Although it was well beyond our budget, we purchased it and found, when we eventually cut back the jungled land, that we were the proprietors of sixty-eight, four-hundred year-old olive trees. For me, it was the beginning of a love affair with the olive tree. Our first harvest, with the assistance of a retired Provençal man, delivered us first-rate olive oil. We then began the long journey of winning the coveted AOC, Appellation d’Origine Contrôlée, designation for the farm, France’s benchmark for quality produce. Today, we also follow organic practices. What do you think is the industry’s biggest challenge? Perhaps this is the moment for me to come clean and admit that I am not, in the conventional sense, in the olive oil business. We do produce our own exceptional oil but in small quantities. I am a writer and filmmaker and it is the history, culture and the people of the olive oil world that fascinate me. During my travels all around the Mediterranean in search of stories, I have discovered several major challenges that lie ahead for the industry. I think the most serious is over-industrialization; it damages the earth by excessive use of pesticides and over-irrigation and is running the risk of driving olive oil prices down. What do you most enjoy about the business? I get huge pleasure out of meeting others who are as a passionate as I am about olive farming and the olive tree. I have colleagues and friends now all across the Mediterranean. Their stories and history are the tapestry of the Mediterranean itself. I have UNESCO patronage for a ten-part documentary film series set round the Mediterranean entitled The Olive Route. I am also in the early stages of setting up a Mediterranean food company. I will look to my colleagues throughout the Mediterranean and see how I can use my name as actress and writer to assist in reaching larger markets for small, independent producers of olive oil, olives and olive-related products.. I travel so frequently that for my husband (he is a documentary film producer) and I to enjoy quiet time at our olive farm, Appassionata, is simply bliss. Strolling across olive terraces with the dogs at our feet. Perfect. Two: tenacity and a sense of humor. What is your favorite food and olive oil pairing? I begin my day with olive oil and enjoy it with freshly-picked and sliced organic tomatoes and cucumber, a chunk of dark bread and a helping of goat cheese. I picked up this habit in the eastern Mediterranean where they believe it sets you up for the day and is exceedingly good for your health, protecting against certain cancers. At the side of my husband, Michel. Achievement is an accumulative process, in my opinion. One brick builds upon another. The first of my Olive Farm books became a bestseller and since then I have written five others in the series, and now we are filming the TV series inspired by two of these books, The Olive Route and The Olive Tree. Being invited to work with UNESCO to set out and support an Olive Heritage Trail round the Mediterranean... It is all very exciting and deeply satisfying. In Sydney, Australia, when I was working as an actress on a film there. It was my first date with Michel and even before the first course had arrived, he asked me to marry him! Life has rolled on since then. After these ten documentary films? I am writing another book for youngsters and two more books for adults.